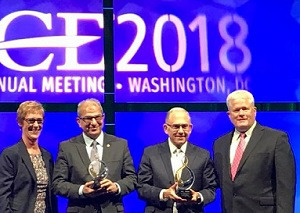 WASHINGTON — Higher education leaders and stakeholders gathered for the 100th annual meeting of the American Council on Education (ACE) to share ideas and best practices revolving around the most pressing issues institutions face today. Notable conference sessions highlighted advising and data strategies to increase student retention and support, practices for institutions to collaborate with the Office of Civil Rights around Title IX policy and the need for some institutions to grapple with their troubled history of slavery. During the keynote session, Presidents Ruth J. Simmons and John J. DeGioia explained how their universities created unique projects — the Center for the Study of Slavery and Justice at Brown University and the Slavery, Memory and Reconciliation working group at Georgetown University — that would “walk people through the truth” and shed light on each institution’s ties to slavery. However, the presidents noted that in doing so, they faced people who were not enthusiastic about the cause. Confronting this history in a way that still fosters unity in a community means that “we can touch the ‘third rail’ of race and survive it … you can talk about the wrong that’s been done and be forgiving,” Simmons said. Simmons added that education leaders have a responsibility to maintain their institutions in a way that people can have trust in them — “Trust because we are always elevating the conversation. Trust because we are cueing to the values that we espouse. Trust because we are transparent,” she urged. The presidents said a commitment to truth should be modeled in the leaders that students look to for support. Simmons tasked the room full of leaders with carrying the responsibility of ensuring that young people’s hopes for their future become a reality. Other conference sessions addressed the data- and technology-driven ways that institutions can retain students, improve student persistence and maximize academic program offerings. Proponents for data use discussed how concrete quantitative measures can change the nature of conversations regarding how institutions maximize resources and mission-driven activities. In “A Data-Driven View of Portfolio Management,” Andrew L. Laws, managing director of Huron Consulting Group, said institutional goals should encompass ensuring financial stability, fulfilling strategic priorities, strengthening market differentiation and aligning student outcomes with market needs. In “The Emerging Discipline of Student Success Management,” Ed Venit, managing director at EAB, noted that many institutions are facing a tough enrollment and funding environment. He recommended that institutional leaders think about student success as a revenue plan. That should include hiring more advising professionals and increasing the use of real-time data to track and improve student outcomes. Venit said it is important for institutions to focus on keeping the students they already have, which could result in a return on investment in revenue from tuition. “You’ve invested a lot to keep these students here,” he said, adding that most institutions cater to high-risk students while missing “the murky middle” — medium-risk students who leave their sophomore year or later. Additional strategies Venit suggested included linking metrics with larger institutional goals, reorganizing advising infrastructures to go beyond just student registration, implementing equity-based advising that caters to all student needs at every risk level and providing emergency “microgrants” to clear student balances so that they can graduate on time or, if needed, return another semester. Dr. Paul Dosal, vice president for student affairs and student success at the University of South Florida (USF), continued the push for using predictive analytics in his session focused on using data to reach the right students and unlock performance-based funding. USF tracked four- and six-year graduation rates for students and compared them across race, gender and economic status. After using predictive analytics, officials made significant progress in closing outcomes gaps between different racial groups, Dosal said. “We believe in equity in outcomes,” not just in admissions, Dosal said. To that end, USF partnered with Civitas Learning, a student success platform, to help achieve goals for student support using real-time data and insights. In 2016, USF leaders created a Persistence Committee — a cross-functional team that identifies at-risk students and delivers “the right support to the right student at the right time,” Dosal said. Predictive analytics, Dosal asserted, can help institutions reallocate their advisors’ time supporting low- and high-risk students because the kind of encouragement students need can vary. “It’s important to pair both institutional change with whatever technology choices you’re making,” she said.